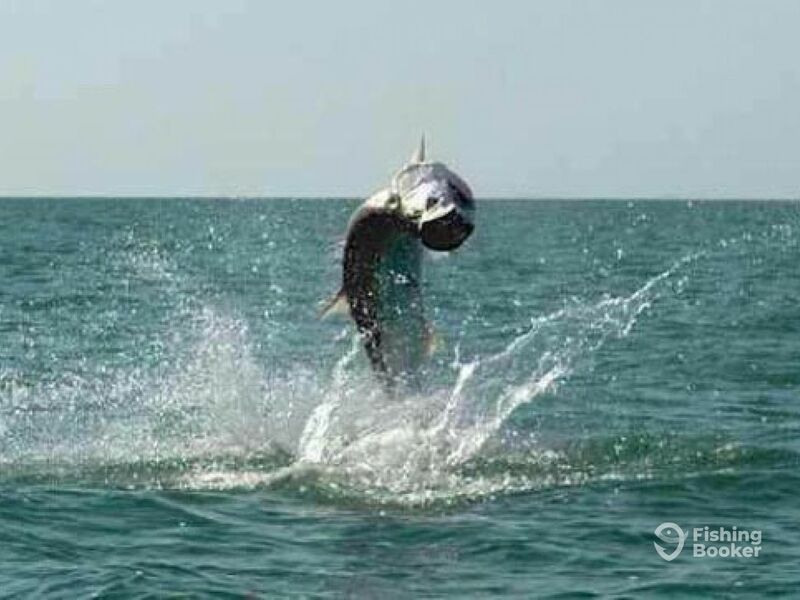 The huge tarpon have arrived here in the lower keys! We are seeing and 100+ lb. tarpon in all areas of the Lower Keys. These are the true migratory trophy fish that people from across the world target year after year. Don’t miss out on the most thrilling, adrenaline pumping fishing in the Florida Keys. We are fishing artificials and a variety of colors. Most fish are laid up and getting ready for their annual show in the next couple of months. So, why choose us when looking for a guide here in the Florida Keys? Captain Jason Gabriel has over 20 years experience fishing and guiding here in the Florida Keys, the Bahamas and the entire east coast. He is well seasoned and he also has an off kilter sense of humor that will keep you well entertained. We offer a great experience and our reputation says it all. Our high quality Hell’s Bay flats boat is the mode of transportation. A well built quality boat is just the start of why you should fish with us. It makes a huge difference in your success of catching fish. Quiet, dry and fast. This boat gets you within casting distance and allows you to make that perfect presentation to your fish. 12 o’clock. Cast 20 ft. That’s what we’re talking about. The second great detail that we provide is all new tackle and all upgraded spinning rods and fly rods. Our flys, tackle, boat and rods are new and the best in the industry. We may be priced a few dollars higher than your average charter but we believe you get what you pay for. We are a well established, professional business with a proven track record here in the Florida Keys. Capt. Jason Gabriel has an amazing reputation as one of the best captains and guides in all of the Florida Keys. Do your research and you’ll understand the difference in quality. So, if you have always dreamed of landing that silver king of the sea, we will make your dreams a reality and you’ll have fishing memories to bring back home with you until the next year. Trust us, once you catch your first tarpon, you will be back every year. I was born and raised in South Florida. I started fishing Key Biscayne, Flamingo, Islamorada and the Lower Keys at a very young age. I was in or on the water as much as possible. I learned at a very young age to navigate and fish the waters from Palm Beach to Key West. I knew from a young age that I wanted to have a career as a captain or guide. I studied for my captain license as soon as I was of age and I started guiding in Islamorada out of Holiday Isle, Worldwide Sportsman and Papa Joe’s. After many years of guiding anglers to their inshore dream species and many tournament wins on spin and fly tackle, I was offered a position on a large sportfishing yacht and the next chapter of my career began. While on vacation from a motor yacht in the Keys, I took my beautiful bride Debi fishing and she saw the passion that I had for inshore and offshore fishing. We packed up and moved to the Lower Keys to start renewing my passion all over again.